Mmmm spanakopitas! That's basically what these are--the Greek, deep-fried, spinach-and-feta filled delicacy--but a lowfat and healthy version. 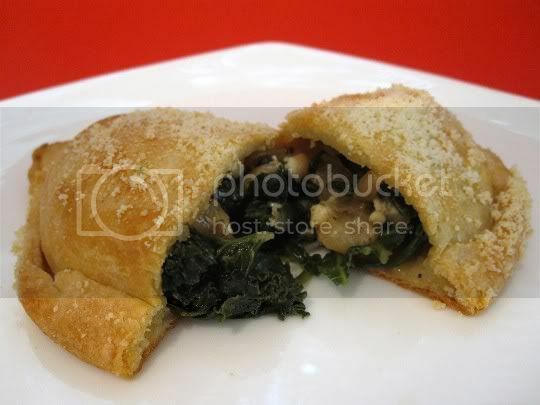 Onions, garlic, spinach, and yummy kale are sauteed, then mixed with feta cheese, and filled in crescent roll dough. Sprinkle with Parmesan cheese and bake until browned...and these turnovers smell amazing when they're in the oven. Aside from the dough rolling and veggie filling, these are relatively easy to make. They'll make a great appetizer, or even a main dish (since you probably will want more than one!). A few recipe notes: Omit the salt! Although only 1/4 teaspoon is used in the veggie mixture, the feta AND Parmesan cheeses add more than enough salt to the dish for any more to be necessary. The pepper amount may seem like a lot, but it works in the end; and the nutmeg addition is an amazing pairing with the feta! Also, I'd suggest baking these a little longer than the suggested time of 18 minutes. Because the dough is rolled so thinly, the turnovers really need to crisp up and be firm enough to hold the filling...so maybe an additional 5-10 minutes. Make again? Yes. Anytime I'm in the mood for some good Greek food, I won't have to run to the deep-fried version any more!